Yes, I’m still alive over here in the land of the French! Fall has turned the Alps and the trees into a beautiful display of color. As the leaves continue falling, I seem to be finding myself busier and busier with my schedule at school and with just the daily tasks of running errands and washing clothes. It is a blessing to have such a beautiful setting for these daily activities though! The past few weeks have been so full of new experiences. I’ve met new people, tried different foods, learned lots of new vocab, and learned some more lessons through experiences which just seem to happen to a foreigner here. I can’t say all my administrative woes are over yet. I’m still waiting on some all important letters to arrive, but I’m told that this delay is pretty normal. So, I continue to wait and seem to stay pretty busy in the meantime. The end of October was nice. I got a week off, and as a result, I slept quite a bit. I’m glad I did because I think I needed it even more than I realized. I also did get caught up on grading and lesson planning, and even had some quiet afternoons spent reading Dickens with soft music playing in the background. I was also able to change my routine a little and get out of town to spend a day in Lyon during the break. That’s actually where this picture was taken. Have I mentioned my love for parks recently? 🙂 The French definitely have a talent for designing parks, I will say. 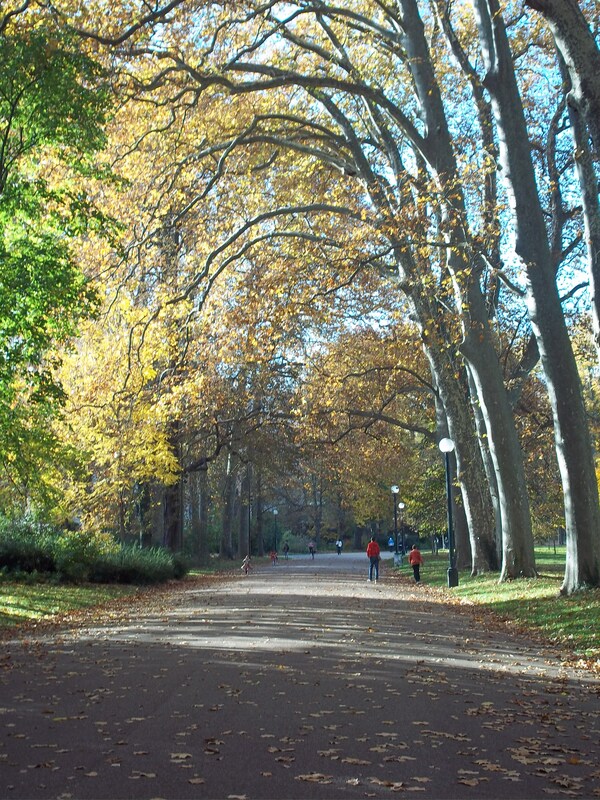 There’s a big park in Lyon called the “Parc de la Tête d’Or”. [Don’t ask me why the name of the park is basically the “Park of the Golden Head”…I have no idea!] A member at the church where I attend mentioned it as a place I should see but added that he wasn’t so sure that I as an American would be interested in it since he jokingly mentioned that we seem to rush around to see only the major sites. I laughed and asked him if he was being slightly stereotypical there. I definitely enjoyed my peaceful stroll there after a long day spent exploring the old city of Lyon. Maybe I did fit the stereotype somewhat, but I think the French laid back view on life has rubbed off on me in several ways. 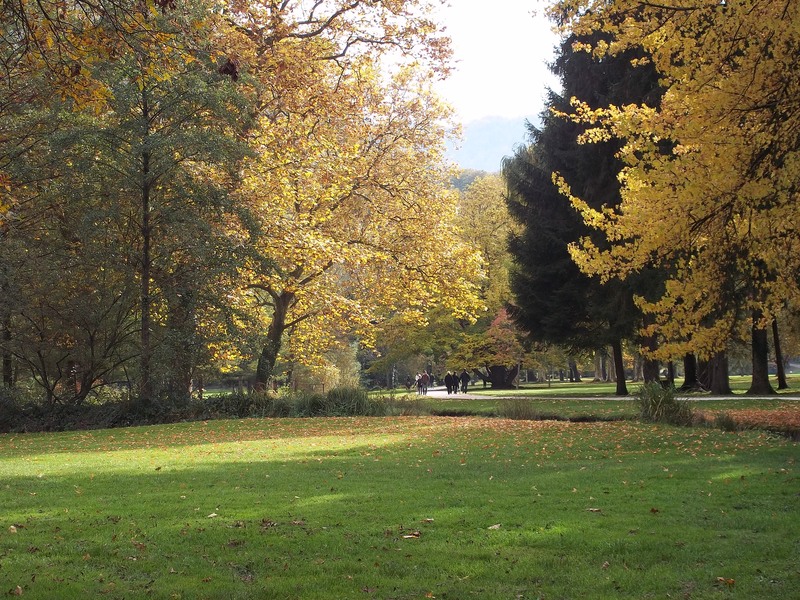 Besides, who doesn’t enjoy a walk in the park spent gazing up at the changing colors of the trees? I did find out that in Lyon there are stairs….everywhere. Everywhere. Stairs! I think I was still dreaming of stairs after I arrived home. Of course, I figured out after laboring up to the top of the hill where the famous Basilique de Fourvière is that there was, in fact, a cable car I could have taken to get to the top. If you imagine that part in “The Sword in the Stone” when the wolf reaches the top of the hill only to see Arthur and Merlin walking along at the bottom of the hill he’d just climbed, his reaction was pretty much the look on my face. I think I missed taking the cable car because I saw a sign pointing the way to the cathedral and thought it was a “shortcut”. I should probably pay more attention to the map next time. 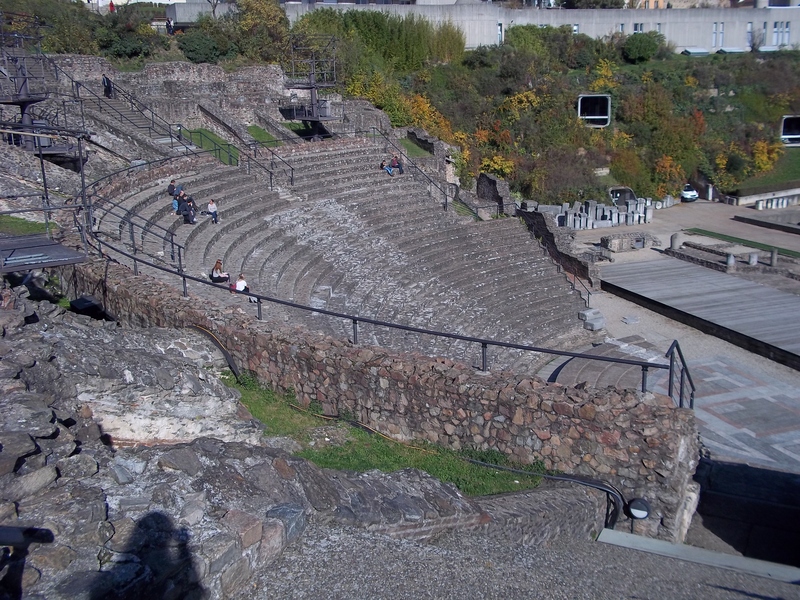 Then, there were the stairs at the Gallo-Roman amphitheaters, then the stairs to get in and out of the metro, the stairs up to the boulangerie to buy a sandwich, the stairs on the train home…goodness, I was tired. Though my leaving the stairs of Lyon behind was not all I would face to get home. Apparently, having trains stopped on the tracks for two hours is not completely unheard of around here. There was an accident on the tracks further south, so our train was stopped for quite a while and then moved very slowly until it finally reached Grenoble again. Unfortunately, I had brought nothing with me to read as I didn’t want to lug around my big volume of Dickens (especially considering the stairs, glad I didn’t). So, I studied the map of Lyon quite extensively, discovered that my little block of a French phone which does little more than make calls and sort of text did actually have the snake game on it (don’t think I’ve played that since I was a high school kid playing it on my mom’s first cell phone), and then found a sermon on my iPod to listen to as well to pass the time. I did eventually come through my door about three hours after my expected arrival time. This was followed by my finding something to eat and then falling asleep pretty soon after. I was happy though! It was overall a beautiful day and nothing delights me more than getting to explore a different city. I promise I’m teaching them more than that! Some days though, goodness…I shake my head and wonder why I’m here teaching English when I love teaching French so much. Then, the next day I have a light bulb of how to teach a lesson and can’t imagine ever going back to teaching French. Teaching is like that though, full of ups and downs. For now, I think I’m going to sit down and actually work on making progress grading those eighty-something exams and work on writing out my comments on some speeches and presentations since I have tomorrow off. I’m so glad to have a Wednesday off! It’ll be nice to have a break from my often crazy long Wednesday. Though indeed it’s been a headache getting the students’ make-up activities together amongst a chorus of groans and exclamations of “C’est injuste!” but in fact, they need to do these activities to be ready for an upcoming exam. So, sorry, no Star Wars and yoga apparently. Actually, I don’t even like yoga….yogurt….now, that’s another story entirely. Especially French yogurt and fromage blanc…cheese….on second thought, maybe I need a snack before I dive into grading. My adventures among the French hit a major snag this past week which knocked me down pretty hard. I had a moment of angrily wondering if all these complications and obstacles I’ve gone through were worth it. I realized though that a lot of why I was reacting the way I was although I will attest that the complication is indeed serious was because of fatigue. Ever since I arrived nearly two months ago, it’s been nothing but work with only a brief reprieve here and there. On top of work, I’ve been stressed about one thing or another not working on both sides of the globe. It’s been a lot to handle while still trying to keep a calm composure. So, today, I decided that I would get out of town, leave the worries and stacks of grading behind, and return to a place that had enchanted me when I was here nearly seven years ago. To Vizille I went. Can you tell why? Vizille is a small village just south of Grenoble which has a beautiful park and manor. The manor now houses a museum of the French Revolution. It’s a fascinating museum that I visited as a study abroad student, but today, I was mainly interested in strolling the trails through the fall foliage and finding myself a nice little bench to relax on while I did some journal writing. I have to confess to nearly tearing up as soon as I walked into the park. This was just what I needed, and it was just as beautiful if not more so as I remembered it being. I had hesitated going this morning mostly just due to fatigue (the neighbors next door decided to have a rather loud party last night), but my entire being just sighed with relief as I breathed in the fresh air and gazed upon the breathtaking contrast of colors. I’ve missed nature. I feel like I’ve been stuck in the hustle and bustle of a city with dirty streets and loud vehicles for far too long. It’s so peaceful to hear the rush of water from a small waterfall, the wind blowing through the trees, and the birds chirping and singing. Yes, this was a good idea. This is what I needed. 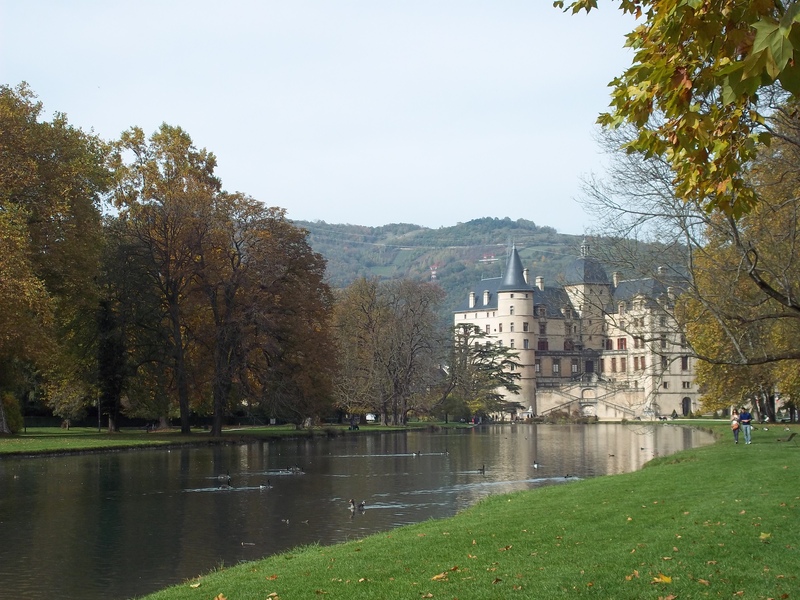 I strolled along and just enjoyed being here at this time getting to see France in the fall. I’ve never been here during the fall, so it’s been a special treat to see the mountains become colorful and see the trees begin changing in town and around. Others in the park seemed to have the same look of relaxation as they walked along. Occasionally I shared a nod and a smile with a passerby, but everyone seemed to be respectful of the need to unplug and just be. I was delighted to find myself a little bench and write I did for a good half hour until I felt the need to get up and walk. My view of the castle/manor from my bench. I’m glad that God has created such beautiful places in which we can find an occasional retreat. I wrote a lot in my journal about what I’d been through so far but also enjoyed writing about the people He sent to comfort me and cheer me up. I feel like it’s going to be okay. That doesn’t mean that every detail will work out like I would like it to, but I know He’ll be with me no matter what the answer is. I’m not forgotten nor am I forsaken. 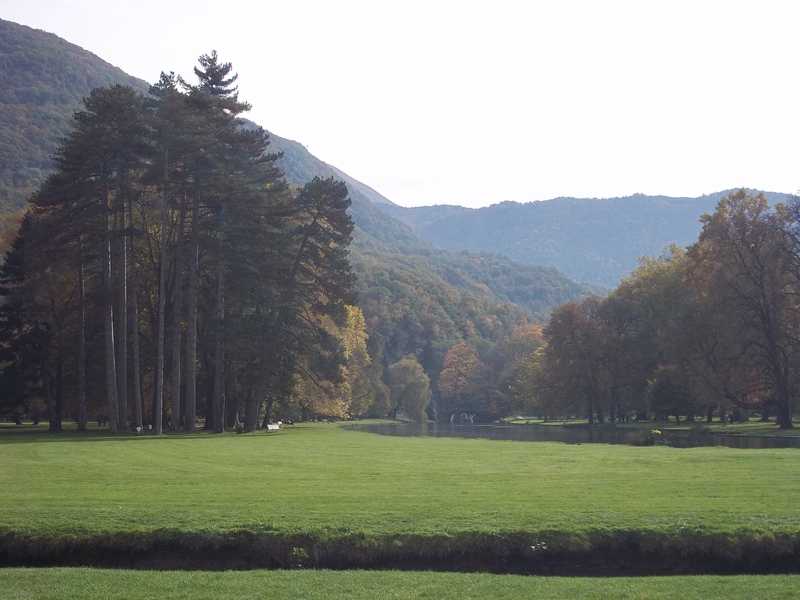 Fall in France, it’s easy on the eyes! I would be careful in a place like this though. It has a way of casting a spell on you making you dream about it even years after you return home. I have often in the years since I was last here thought of this place and how peaceful it was. 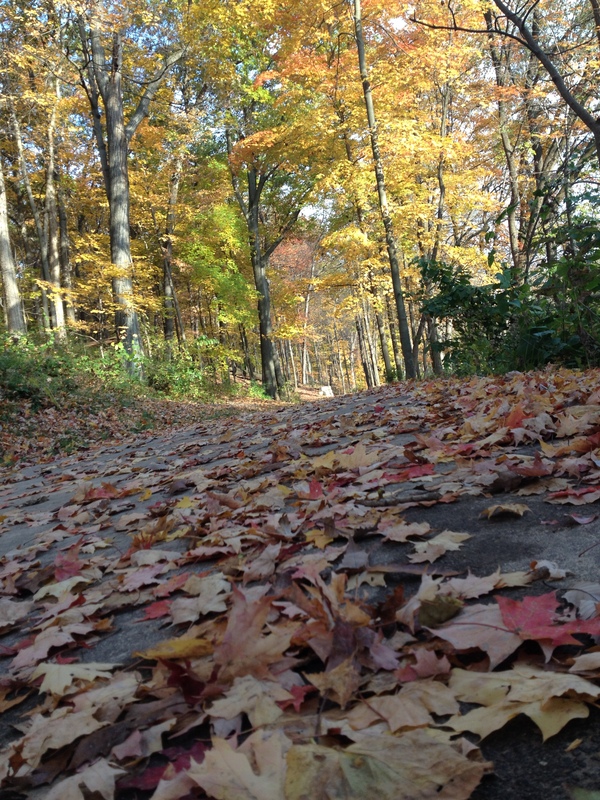 Something about fall just added an extra flavor of enchantment. However, I would not paint France as a land of paradise. Enchanting indeed, but I think I made a mistake when I was here before. I came then as a study abroad student with stars in my eyes practically floating on air that this dream to come to France had come true. This time I’ve come and am experiencing everyday life in France which effectively means that I don’t see France in the same way. I see it more as it really is because of the struggles and the experiences I’ve had so far. This is why I’m here. I’m here to truly learn what it’s like to live in the French culture. Well, that and to drink coffee and eat pastries. Let’s not forget what’s important here in having a “cultural experience”. 😉 Take a look at this amazing coffee I got from a café the other day. Now, that is what I call a café crème! I even let out a “Wow!” when the waiter brought it. 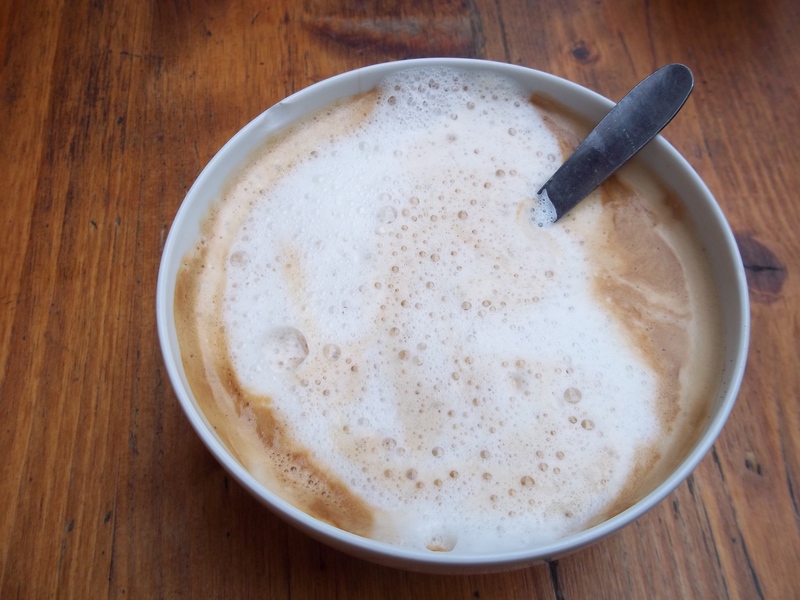 Coffee, milk, and a spoon to go along with it, perfect for the rainy day that it was. I believe I’ve found “my café”. Been looking for it, so I’m glad to have found it. And so, life continues ever onward even with its bumps and curves in the road. I’m thankful to know Who holds my hand and Who holds tomorrow.